Depiction of RPC-068 in containment. Containment Protocols: RPC-068 is housed inside Isolation Block 4-7 at Site-009. No written or printed text is to be brought within 50m of RPC-068 outside of testing; to this end, Isolation Block cells 4-6 and 4-8 have been vacated. All standard operating manuals, emergency guidebooks, etc. are to removed from their regulation locations and replaced by electronic tablets when absolutely necessary. Personnel are to be searched for written material and physical writing implements (pens, pencils, ink, etc.) before entering the 50m perimeter. Written material may be brought within RPC-068's perimeter with approval from the RPC-068 Head Researcher. All tests, results, and observations are to be recorded and stored in the Site-009 database, available below. In reality, RPC-068 is contained at Site-038; the internal record for your flight to Hong Kong has been falsified. These obfuscations serve the purpose of misleading any attempts to locate RPC-068 by their original creator, the RCP Authority (GT-01 Group of Interest). While nearly unrecognizable at times, the RCPA is an alternate timeline version of us, and both organizations occasionally breach the others' security and records. 'Guest' standard human containment amenities are to be provided, and RPC-068 may choose a meal from the Site cafeteria menu twice a week, contingent on good behavior. All packaged/labeled foods are to be opened and emptied onto the tray before being brought to RPC-068. Description: RPC-068 was acquired as a prisoner during a raid on an Authoritarian surveillance post in █████, Guatemala. While the rest of the hostile personnel, anomalous or otherwise, were terminated or successfully fled to their home timeline, RPC-068 was knocked unconscious by a collapsing structure. A standard briefing on the RCPA Group of Interest is provided below. Description: The Righteous Centralized Protection Authority (RCPA, widely referred to as the 'Authoritarians') is an alternate timeline iteration of the Authority that has openly seized control of their world. Initially motivated by the desire to protect humanity more completely and efficiently, they have long grown corrupted and arrogant in their dominance. Embracing the use of the anomalous to their own ends, the RCPA's ethos of "justice" has been twisted into a creed that demonizes rogue anomalies and dissidents indiscriminately together as "villains". Recently, certain links between the RCPA timeline and our own have opened; their presence in our world has been actively combated, as their creed of justice and utter lack of subtlety are antitheses to our Authority. Addendum: The RCPA hires or creates anomalous persons on a wide scale to enforce its rule; known as Protectors, many are idolized in state propaganda. While most Protectors combat rogue and destructive anomalies (often more powerful than counterparts in our timeline, due to the open and widely-available nature of the anomalous), others aid their ASF in suppressing various local insurgencies against the global power of the Authority. RPC-068 is apparently an example of a mass-produced 'Protector', the RCPA term for their anomalous enforcers. While otherwise a non-anomalous young woman in terms of endurance or intelligence, RPC-068 exhibits several anomalous abilities in regards to written or printed text. A basic summary of these abilities is provided below, in an acquired RCPA document detailing the use of "Librarian-class" Protectors to unit commanders of their ASF1. [-] Access granted. Justice follows the RCP Authority. Unit Commander: Congratulations are in order for being issued a Librarian-class Protector. Your dissident-suppression record is guaranteed to be doubled or better in the coming months. This brief guide will aid you in maximizing the utility of this most versatile asset. Within a 100m radius, a Librarian is capable of sensing dissent and sedition in written text. Your Librarian will lead you to the villains. Their sense of the meaning behind the words is faultless; the man, woman, or child they bring before you is always a dissenter. Within a 40m radius, through the enormous skill of our anomaly engineers, a Librarian pulls a fully-real manifestation of written words from the text. The primary use of this ability is to destroy dissent with their own hateful words; a call to assassinate the rightful rulers of a province instead spews bullets at its readers, a banned allegory of our just Authority in flames instead burns the hands and home of its author. While this is an efficient and direct means to eliminating villains, an important ancillary benefit is to encourage citizens to avoid those who would write against Justice. While we cannot monitor and control written words to the same extent as the intraweb or phone lines, the Librarians go a long way in making up the difference. Additionally, your Librarian can create weapons and ammunition for your team by merely writing in a notebook. Extensively educated in the entirety of the 01-Weapons classification, and parts of 02, you may customize this to a certain extent by having your Librarian memorize certain weapon schematics. Your Librarian cannot be recorded by electronic devices or film cameras; this is to preserve the mystery and expectant terror their presence inflicts in dissident populations. These anomalous abilities were confirmed by the actions of other "Librarians" during scattered encounters with the Authoritarians; RPC-068 is the first to be captured and interrogated at length. The drawn depiction of RPC-068 is due to the anomalous inability to capture it clearly on a recording device. Immediately after RPC-068's acquisition, on a █ to █ vote, the Global Directors approved standard humanoid testing over a dissection; RPC-068 has proven to be unexpectedly cooperative during testing. The Authoritarians might be crazy, self-righteous bastards, but they share our general log format. Using RPC-068's RCPA-issued ID, we managed to retrieve some operational logs concerning RPC-068's deployment in her universe. Banned novel depicting a successful revolution in Zealand. The ambush was swift, cutting down the Hredcloaks around the truck with a burst of machine gun fire. Reader killed by one of several gunshots originating from the book. Accuracy was unaimed but sufficient. Poster advocating the assassination of local Authority administrators. […] and a blade in their lying skulls! Reader fatally wounded by an Authority combat knife thrown from the words. Poster torn down by citizenry shortly after, demonstrating a Librarian's psychological value. Pamphlet distributed by the PCEAO2 in the Peking S.E.R. Soon, brothers, the [SLANDEROUS EXPLETIVE] Authority's leaders will hang on rope of their own evil! Noose of local hemp erupted from the pages, catching the reader's head and snapping his neck. Draft written by a wanted dissident author. They will face true justice in the end. Block of exceptionally pure ice strikes the reader, knocking them out. Attempts by neighbors to render aid lead my team straight to his apartment. Sanctioned children's book recited to an underground slum school linked with Angelan rebels. Mr. Sheep told his lambs to hope, hope for the day that the bad animals are burned away in a big righteous fire. Flames from the book ignite and engulf the room; like finding a nest of infant rats before they're grown and hard to catch. The Librarian weeps at the splendid efficiency of it. First testing phase will be conducted with a word or short phrase, each written into a separate page of a lined notebook. Words will be relatively benign objects, testing the functionality of RPC-068's manifestation abilities. T-shirt. A standard Authority-issue t-shirt, altered with RCPA-branding. Smells brand-new. Hung up in the Isolation Block 4 break room. Fine wooden table. A mid-sized wooden office table. Disassembly reveals it to be constructed of heavily varnished plywood, weakly held together with PVA glue. It looks like a homeless man's idea of what a good office table is. Fine from a distance, but I think she doesn't know what it's actually made of. Apple. A ration packet containing three small apple slices. After further testing, described as "rancidly preserved" and "[the] worst ration I've ever tasted." Interesting. It seems she interpreted the word in a form she was most familiar with. Cup of apple juice. A cup of ochre liquid, same color as the previous ration slices. Tastes like "a disgusting liquid version" of the same. We'll return to the apples in a bit, I have a theory. Mechanical clock. RPC-068 hesitates, evidently uncomfortable with the task. Eventually manifests a non-functioning plastic desk clock, an empty shell filled with gears. Again, very interesting. This ability seems entirely dependent on her comprehension. A juicy, tasty, whole red apple. RPC-068 was provided with an image of a whole apple beforehand. The whole apple produced, tasting "just as horrible" as the previous ration slices. Final thoughts collected below. Clearly, RPC-068 cannot summon a truly accurate object if she doesn't have any real knowledge of it. A bullet, noose, or knife is easy to understand; the flavor of a fruit you've never tasted outside of a ration, impossible. I expect this pattern to continue with other common objects outside her violent but limited experience as an RCPA weapon. I'll petition the Head Researcher to interview her about this. Foreword: Conducted the following day after the conclusion of testing Phase One. Rsr. Sharon: Good morning, miss. RPC-068: My designation is 531. Rsr. Sharon: Well, that's not right either. RPC-068: I apologize, ma'am. My batch number is 48. Full designation B48-531. Rsr. Sharon: Why do you insist on a number? We don't expect it. RPC-068: Well - I don't impose - you should. This is just another Authority, everyone has a number. Rsr. Sharon: We have a different number if you'd like. 068. RPC-068: Wow! That's a very small number. Rsr. Sharon: You'll find there are more differences than you think. Perhaps a pleasant surprise, or two, if you allow it. Rsr. Sharon: Come on, must be a little bigger. Give me that. RPC-068 titters, covering her mouth. Rsr. Sharon: I'm only here as a follow-up for the previous testing. You've been wonderfully cooperative, I must say. Talk about pleasant surprises. RPC-068: I would never be difficult. Rsr. Sharon: Is that your choice? RPC-068: I'd never think of it, ma'am. Rsr. Sharon: Okay. We'll talk about free will later. I'm really here about the clock and the apples. RPC-068: I'm very sorry. Those weren't up to spec. RPC-068: It's not fair. I wasn't trained with apples or clocks. Rsr. Sharon: You need prior knowledge of the word to, well, manifest something? Not just pronouncing it, I'd imagine, but familiarity with the object and its characteristics. RPC-068: Uh, maybe. That feels right. I was thinking very hard on what makes a clock spin - then I remembered this one time, in Peking, L5-3 shot up a desk with a clock on it. The gears flew everywhere - did it work for you? Rsr. Sharon: Not quite. If you had a map of clock's internal workings, would that help? RPC-068: Yes! Like the rifles and missiles, I've studied since I was small. If you give me those words, I won't disappoint. Rsr. Sharon: Not today, 068. It's come to my attention that you don't know what an apple is. Rsr. Sharon: There'll be more testing, but I grew up in Washington, a little near █████. Can't let that slide. The interviewer produces a whole apple, instructing RPC-068 to bite it. RPC-068: Oh, this is - wow. Phase two will test RPC-068's manifestation abilities in regards to weapons. Tests will be conducted in an on-site blast chamber, with RPC-068 manipulating a sheet of notebook paper through ballistic glass. Sergeant Halverson (ASF) and I will be present; if 068's utility is more flexible with weaponry, the ASF and my department of Research are interested. Assault rifle, fully loaded. An Amazing! Co. branded SCAR-Mk16, fully functional and loaded. Described as an "exact replica" of our Authority's standard-issue weapon by Sgt. Halverson. This aligns with reports that the Amazing! Co. GOI exists in 068's universe, operating as a global manufacturer of standard (if extremely diverse) products, and an Authoritarian contractor. Generic assault rifle. A fully functional AK-74M appears, unloaded. 068 claims that she studied non-standard weapons to help her team conduct "deniable killings". M67 fragmentation grenade. A fully functional M67 grenade appears, again branded by Amazing! Co. Another piece of shared equipment between us and our counterparts. No surprises. Live M67 fragmentation grenade. The grenade (missing its pull ring) appears, exploding four seconds after manifestation. Performance appears to be entirely consistent with ASF standards. Sgt. Halverson openly remarks on the utility of "infinite ammo" in the field. 068 looked rather pleased with herself after that. Live M18 smoke grenade, thrown. The grenade appears, hurled upwards at a speed of ~34m/s and bouncing off the ceiling. Smoke rapidly fills the chamber. When questioned, 068 claims that 35-40m/s is the maximum velocity she can impart on an object without "other forces" acting on it, "like a rocket motor." Live Stinger missile. The requested anti-air missile erupts from the pages, exploding against the ceiling and causing extensive damage to the test chamber. One range technician is injured by debris. I'll admit, we got carried away. Addendum: Request by Researcher Budylin for offsite range testing with advanced weaponry against target drones is pending. Incredible. 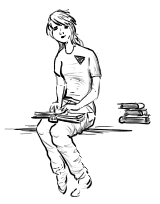 If she wasn't a walking security headache with the danger of running across a book in the field, the ASF would be interested in the potential of summoning equipment for any circumstance during an op. With 068's institutionalized cooperation, I'm thinking of shaving a chunk off the budget for expensive missiles. Sharon's going to object to it again, though, no doubt. Foreword: Brief exchange recorded immediately after the conclusion of 068-Testing Phase Two. Rsr. Budylin: Excellent demonstration. We're very interested in your abilities. Rsr. Budylin: Tell me, just how many weapons are you trained in? RPC-068: Oh, the Red Lady's weapons are very reliable. 'Weapons as ageless as the Lady's stern beauty', as the ads go. Rsr. Budylin: Timeline details are Sharon's obsession. You and I are talking utility. That's what we're good at. Rsr. Budylin: Right. You know how much a high-spec missile costs these days? No reason why your abilities can't mass-produce them for free. RPC-068: Maybe, sir. I think they tried that with the entirety of Batch Two - that's what my team leader told me, anyway. Missiles and costly airplane parts and all that, they tend to, uh, degrade. After a little while. The Helix fleet was grounded for a while after the parts kept failing. RPC-068: Oh, and I remember L5-6 always complaining about the 'crappy Librarian guns' that were still in stocks. One of them failed her during a raid on a PCEAO camp, that's how she died. Rsr. Budylin: Unfortunate to hear. That will require further testing. RPC-068: Do I, uh, get an apple for finishing the test? Rsr. Budylin: Great. What shrink crap is Sharon feeding you? Closing Statement: RPC-068 returned to her cell without incident. Follow up interview conducted by Researcher Sharon the next day. I don't think that encouraging an attitude towards weapons is the best choice right now. In her own words, they fall apart after a little while. There are far more possibilities with pushing her down other angles, and seeing how an Authoritarian creation responds; it could inform us on any number of traits and habits, useful information as RCPA incursions are apparently rising. Phase three of testing will, at my initiate, entirely focus on RPC-068's reaction to various books from our world. She will be instructed to avoid using 'pulling' any physical items from the text, instead of using her anomalous sensing abilities. Castles of Steel3 "A little interesting, all those great ships and weapons and such - oh, don't look at me like that, I can't pull a dreadnought out of the pages. Unless you want me to try. Kind of miserable, too. Dying in a fire on the cold North Sea. Why are you making me read this?" Peasant Uprisings4 "A whole lot of dissent. Kind of weird, though - after I got past that, some of these reasons were pretty okay, I guess. Understandable? Took me a while to admit that, but I had a lot of time with it. Really strange, admitting that those dissidents have a point. Never even thought about it." World War One British Poets5 "Millions of the mouthless dead, across your dreams in pale battalions go. I'm sorry. That line stuck out to me. A lot of them did. If I think too hard, I start to feel really awful. None of the instruction texts were this, oh, complex. Layers and subtlety and, well, it's quite dull. This kind of language borders on the dissident, you know. Not allowed. Oh, my head's still spinning a little." Only the Lover Sings6 "I can hardly understand, what he's getting at. It's very… it's very nice, though, in the end. I've never read anything like it back home. I'd love to meet Mr. Pieper, though, he'd think I'm special, you know? Me! Me and my thoughts and who I am, not the word-pulling, there are tens of thousands of Librarians. He's kind of like you, Miss Sharon!" Barque of Saviors7 "I really liked this. really liked it. Read it all. I mean, like, the words? Not feelings, not themes, just the words and the lovely story they told. Can't remember the last time I read something that way. So slowly. Usually, a lot simpler just to sense the meaning of a warning sign or regulation book or something. I wanted to read the full story! Eagle - Horst Wessel - what a lovely story. A bad past into something, something new, all her crew liking her for who she is, not the past. Makes me wonder about me, you know?" Foreword: Conducted immediately after Phase Three testing has concluded. Rsr. Sharon: How do you feel, 068? Rsr. Sharon: Those poems really stuck with you, huh? RPC-068: Oh - yes. They all did. I'm sorry, that's not what you're here for, ma'am. Rsr. Sharon: To the contrary, that's exactly what I want to hear. Not Budylin's weapons and spreadsheets, none of that. Those books, your reaction - you found them, perhaps, denser? RPC-068: There's so much to them. All the words in my school, everywhere else, they could be so bland. Edited, all of it. You know, have to 'encourage justice in word to deeds'. I mean, you don't know, but I heard that a lot. Words here are different? Rsr. Sharon: Maybe we're just making you read them, at length. I doubt a whole world could be robbed - cleansed - of meaningful literature. Even with your Authority at its head. RPC-068: I don't know. They really emphasized it; there was so much color in the dissident writings, contrasting the dullness, we lashed out. We're trained to lash out. Rsr. Sharon: Not your fault. You were a tool. RPC-068: Can I have more books? Rsr. Sharon: Well, I've got to get them approved. I did bring a couple things for today, though. The interviewer produces two whole apples, handing one to RPC-068. Rsr. Sharon: Budylin's going to get his tests approved, no doubt. But - I hope you look forward to these moments in between. RPC-068: No. I mean - yes. I do like it when you sit down with me. RPC-068: Not a tool. Eagle, not - what was it? Not the Horst Wessel. Closing Statement: Testing is scheduled to continue. Researchers Sharon and Budylin remain assigned to RPC-068. Changes in behavior or newly detailed abilities will be logged. 1. Authority Security Force, the armed wing of the Protection Division. 2. People's Committee for the Emancipation from Anomalous Oppressors. The alternate timeline's equivalent to the PCAAO, the Chinese government's anomalous agency. 3. A history of the dreadnought arms race & combat between the British and German empires before and during WW1. 4. A history of the causes of peasant uprisings in France and China during the 1500s. 5. A collection of said poems by Brooke, Owen, Sassoon, Rosenberg, and others. 6. A philosophical text by Pieper, speaking for human persons to be able to contemplate and appreciate beauty to develop their full humanity. 7. A book about the USCGC Eagle, the history and a modern journey of the old and storied U.S. Coast Guard sail training vessel, the former Nazi ship Horst Wessel.